– I realized I needed to space these posts out more because I am not someone who reads 10 books a month. I’m a slow reader. I love Netflix. This is a deadly combination. OK not deadly, but it does make for an unproductive reader. I started reading for about 30 minutes a night minimum before bed. This has helped me finish books, have a dedicated time to read (which usually goes on longer than 30 minutes depending on exhaustion level), and has honestly helped me sleep better! So now I have a few books to share about. I think doing these posts quarterly instead of monthly will be better for me since I have more books to share about. We’ll see!! Y’all. Stop what you’re doing/reading right now and READ THIS BOOK. Firstly, it’s beautifully written. It is captivating and entertaining and you will not want to put it down. I read 300 pages of it in one sitting– nothing but Friends reruns can hold my attention for that long, y’all. The fact that this was Angie Thomas’ debut novel has me just in awe of her talent. 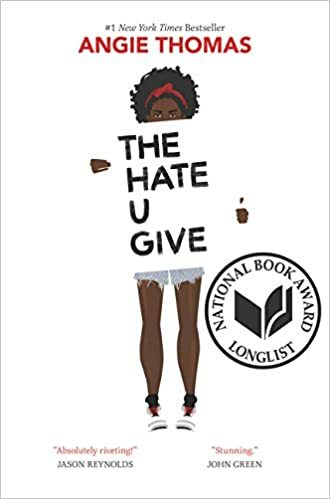 It’s so thoughtful and thought-provoking and hard to read– it really makes you think about the injustices in the world right now surrounding racial tensions and police brutality. It was a heartbreaking story, but it was told with such grace and humor, you almost forget what the story is about. Almost. The gut-wrenching reality this book portrays makes it a hard read, but a NEEDED one. If you read any fiction book this year, pick this one. Thomas’ second book, On the Come Up, comes out in June (I’ve already preordered it!). This was my 1st book of 2018! I liked this book. I didn’t LOVE it like I love my John Green and Sarah Dessen novels, but I enjoyed it. The story is interesting, the characters are clever, and the weaving in and out of stories is unique. I’m not one for reading/writing fanfiction, but I AM a Fangirl of many different things, so I loved reading it from that perspective. I appreciated her look at mental illness in this story (something I pick up on more and more in the things I read these days). The family dynamic storyline is one that hits close to home for me, and I wish it had been explored more/further. The one thing I struggle with in this book and the other Rainbow Rowell book I’ve read (Eleanor and Park): THE ENDING. The ending wasn’t enough closure for me. I want to know what happens next, dangit!! In Eleanor and Park, I just didn’t like the ending. Here, I didn’t feel like there was an ending. I want more Cath and Levi!! All in all, it’s an enjoyable book. If you enjoy fandoms and obsessing over book characters, I highly recommend it. There’s a companion book to this one called Carry On. Carry On is the fanfiction Cath writes in the book (in-between chapters of the actual book, you’ll find excerpts from Carry On and Simon Snow, the book series Cath’s fanfiction is based on). 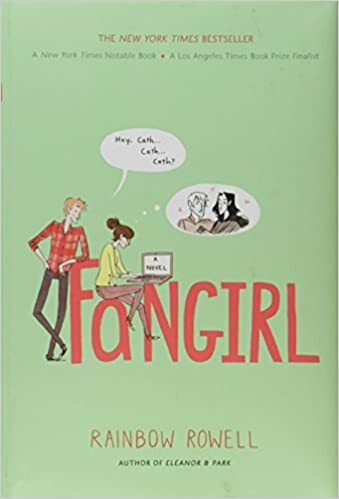 Rowell said she enjoyed writing the excerpts for Fangirl so much that she decided she wanted to write the whole story of Simon Snow and Baz herself! Pretty cool. Now, if this was a sequel with more Cath, Wren, Levi, and Reagan (I loved Reagan– she reminded me of Alaska from Looking for Alaska), I’d be all about it! But instead, it’s just finishing the story Cath was writing in the book. 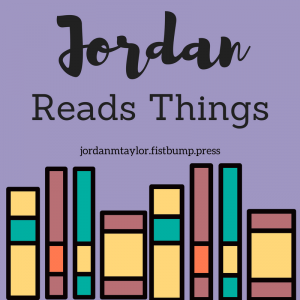 I was honestly kind of meh on those part of the books– they were well-written, for sure, but fantasy is not my genre (beyond Harry Potter, of course), and I was just uninterested in those parts of the book. Not sure if I’m going to read or not. We’ll see! Alex and Eliza by Melissa de la Cruz– started this one last night! After I finish it, I think I’ll grab one of Becky Albertalli’s books. The Upside of Unrequited sounds delightful. I also need to grab a copy of The Masterpiece by Francine Rivers– her Christian fiction is the ONLY Christian fiction I can get through! This last one sounds so interesting. This book, y’all. I learned SO MUCH. It took me forever to read because I soaked it in. Pretty sure I wrote/highlighted on just about every page. I love personality theory (MBTI, Enneagram, Love Languages, etc), but this unpacked those (and more!) in a very engaging, non-heady way. A lot of times when I learn about different things in this realm, I feel like I’m reading an academic book full of jargon and stats that make my head hurt. This book had the stats and jargon, but it was written in a more conversational “here’s what you need to know” style– along with resources to learn more if you so choose. 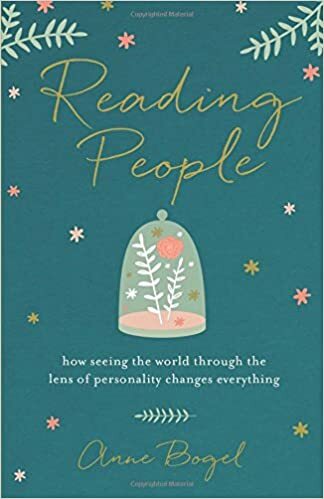 Bogel also uses experiences and anecdotes from her real-life, which I loved– it helps you see how these different personality styles and ‘types’ play out in the real world. She went into detail on some that I’d never heard of (like StrengthsFinder), and helped me fully understand the ones I know and love (like MBTI). She also introduced me to the concept of a Highly Sensitive Person, which made a lot of things click in my brain. (and no, that doesn’t just mean I’m a super sensitive crybaby type, though I am that sometimes). I’ll have to write more in-depth on this sometime– it has been SO eye-opening to learn this fact about myself and how much my sensitivity plays out in my everyday life. A lot of things make so much more sense since realizing I was an HSP! I was on the launch team for this gem of a book, so I’ve been reading/discussing it for quite some time. It is a must-read for singles and those who know and love singles (so basically everyone). It is a NEEDED book, especially in the context of the church and faith community. I’m 25 years old and have never dated– my relationship status doesn’t make me any “less than” of an adult, of a Christian, of a human. Our lives have worth because of who we are, not because we’re married. My lack of a relationship does not mean that my life hasn’t begun or I’m in an in-between stage in life. My life began the day God breathed air in my lungs, not on the day a boy puts a ring on my finger. And the church needs to live this out and celebrate people of all kinds where they are, instead of rushing them into the “next stage” that’s supposedly supposed to happen. I don’t know if marriage will ever happen for me (truthfully, I don’t know if I want it to happen), so I’m going to live my life and live it well where I am, instead of feeling less-than for being single. 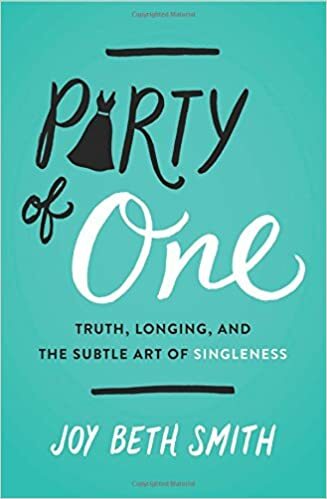 JB dismantles the lies and cliches about singleness in the church using a wicked sense of humor (the girl is funny, y’all), wisdom and life-experience from being in the trenches with this subject, and Biblical truth that counteracts the church’s treatment of singles. My advice on this book: read it WITH people. Talk about it. Ask questions. One of the best things about this launch team (and something that hasn’t quite happened with other launch teams before) is that we took the things we were reading in the book and discussed them with each other! We asked what we thought about certain topics, we asked hard questions about singleness and everything in-between, and it really helped me process my thoughts. This is not a book to read without discussion– spread the words and truths in this book far and wide, because this conversation needs to be brought out into the light. If you don’t know JB, you’re missing out– she’s a gem of a person, and I can’t wait to meet her in person in April. She’s funny and wise and is not afraid to talk about the hard things or ask the tough questions. The world needs her words, y’all– go read them and share them with your friends. I received a copy of If You Only Knew by Jamie Ivey to review for BH Bloggers. I wanted to be on this launch team, but Jamie was sneaky cause I never heard about it until after the team was picked! Oh well. I’ve read her blog/listened to Jamie’s podcast for a few years, so I’m excited to read her story. I also received an early copy of Rachel Held Evans book Inspired as part of a preorder promotion. I’ve only read the intro, but Y’ALL. It’s gonna be soo good. I’ve loved everything RHE has written, and this book will be no exception! I need to dig into it. But next on the TBR list will be tackled this weekend: I’m on the launch team for the amazing Bob Goff’s new book, Everybody Always. Y’ALL. I’ve loved Bob since I first read Love Does many moons ago in college– my signed copy is falling apart due to multiple re-readings. He is the embodiment of wisdom, whimsy, and love, and is one of the most enthusiastic and passionate speakers/wordsmiths I know. I’ve heard him speak a few times (twice in college, once at a local church), and he always amazes me with his wacky style of speaking and his wise proverb-like words. Everybody Always has been in the making for five years, and I’m already 100% sure the wait was worth it. Sadly the launch team only gets the 1st 5 chapters of the book before it releases in April (it’s a HUGE launch team, so they’re only sharing a portion of the book). I’m going to go ahead and knock it out this weekend so I can share about it online. There are some goodies if you pre-order here— early access to the first 3 chapters, a sample of the audiobook, AND a special pin mailed to you! So cool. I’ve been slowly reading through The Highly Sensitive Person by Elaine Aron–as I mentioned above, I’ve been learning more about this discovery in my life, and this is the definitive book to learn it from. It’s very heady and dense, but Elaine also writes using a lot of real-life examples as an HSP herself. I’m distracted by more fun-type books and forget to pick it back up. Oops. I think I’ve mentioned this previously, but I love devotionals. I enjoy beginning or ending my day with them as they offer me a moment to pray, think, meditate, and such. They’re usually short but packed with wisdom and power. It’s my favorite style of writing, and if I ever do write a book someday, I’d imagine writing devotionals over actual books. Savor by Shauna Niequist has been my go-to devo for a little over a year now (i love it so much!). I love Shauna’s storytelling (and her recipes). It’s a devotional I’ll definitely come back to again and again, and one that is worth having on your bedside table to give you a jolt of bravery on a daily basis. 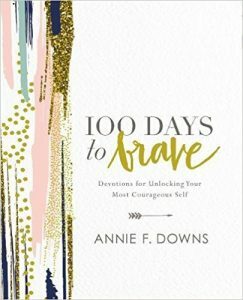 I received a copy of the devotional 100 Days with Jesus as apart of the BH Bloggers program to review. I wrote up a full review here, but the short: this felt less like a devotional and more like a prayer book. Which isn’t a bad thing, prayers are great–but as a devotional, I was feeling meh about this one. Too simple, didn’t really challenge me at all. It was visually overwhelming (lots of ALL CAPS and exclamation points!! ), but was underwhelming content-wise. I was disappointed! On this note, I need a new devotional! For the time being, I’m going back to Savor, but I’d like something new. I thought about Lysa TerKeurt’s new one coming out (especially since I loved her last book, Uninvited). I also thought about Priscilla Shirer’s devotional Awaken. Any other suggestions are greatly appreciated!! I think that’s all for this one. 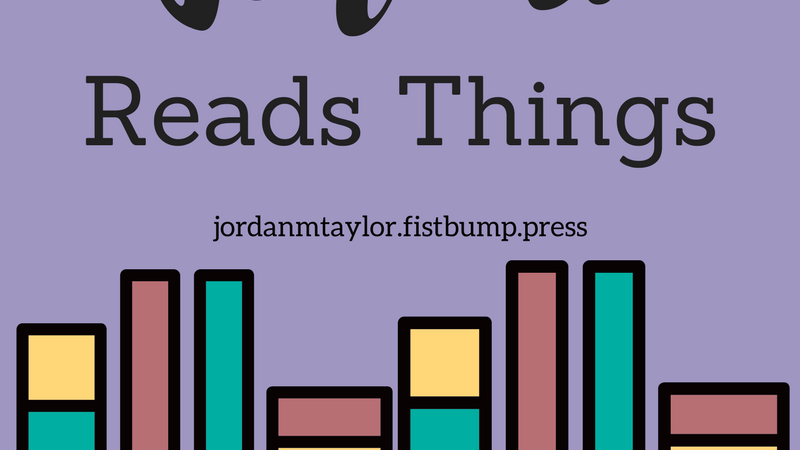 Let’s see how many books actually get read before the next book post, eh? Follow my writer page on Facebook for more writerly updates and sometimes funny things, among other amusements. Thanks for reading!